Recently I found myself in a situation where I had to submit an original medieval fantasy TRPG setting for some work. Ultimately I did not get the job, but my submission got me in the door and helped me make it to the final round of interviews. I’m pretty proud of it. The best part about the rejection is that now I get to share my work with all of you. I only had an hour or so of free time between the time I got wind of the assignment and the time I had to submit. No problem. Creating, outlining, and describing an original world in a short amount of time is exactly what I do. Let me show you how. Now that you’ve got a good idea it’s time for a rough world outline. If you’re limited on time, just write out your big ideas and any details you’re afraid you’ll forget while writing the rest of the world’s description. Then go back and quickly put the details of your world in some sort of chronological order. My world outline for this pitch looked like this. In the beginning humans, elves, half-elves, halflings, and dragonborn ruled the surface in 13 cities. 13 cities form a nation ruled by a council of 13 mage governors. In the beginning dwarves and tieflings lived together in one massive city underground. A mage governor fears death, becomes a lich, makes undead army. Undead army takes surface city, many dwarves and tieflings get away, undead have harder time chasing them down in the monster infested tunnels. 6 remaining surface cities are lifted into the sky by their mage governors and now float safe above the undead. Once your bullet point outline is ready, make another. 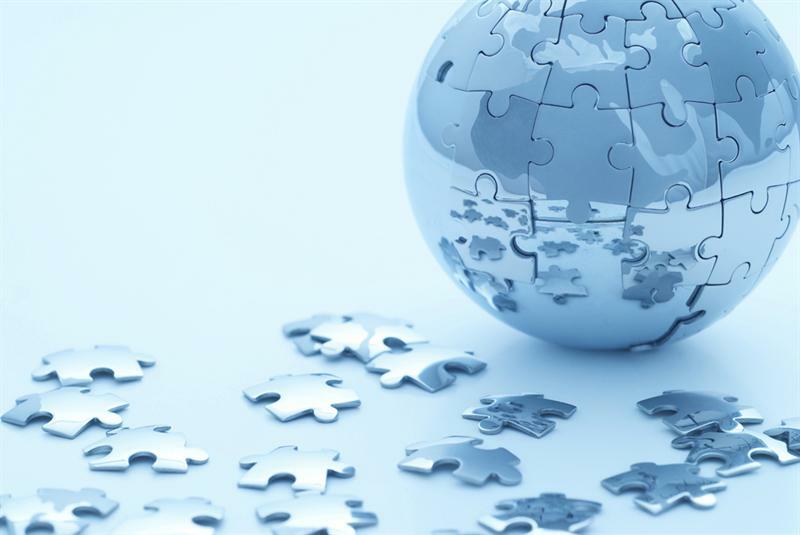 Think of your campaign’s potential arch within the world. The story might change as your game goes on since it hinges on the actions of the PCs, but it’s good to think about your campaign’s overall arch before you put meat on the bones of the world outline. Why? Because your campaign’s outline could affect the world outline. Maybe your campaign calls for a villain or earthshaking event you haven’t included in the world outline. If you add details to from you campaign outline to your world outline, those details will feel less tacked on (e.g. suddenly wand theory is a huge plot device which shows up in the final book of the Harry Potter series). Here’s what my campaign outline looked like for this pitch. PCs start transporting goods for a mage governor and have to fend off sky pirates. PCs find sky pirates which attacked them part of some greater plot. PCs slowly uncover the secret plot – the pirates and others (including high-ranking public officials) are feeding intelligence about the people living in the sky cities to the undead below, but why? PCs investigate plot by exploring the surface world of the undead and are aided by the dwarf and tiefling survivors who have evaded the undead by living a nomadic life underground. PCs discover the undead are building their own airships and making dracoliches to attack the sky cities. PCs return home to defend against the attack and discover the attack is only half the plan. If the undead get close enough to the cities they can enact a ritual that will crash the sky cities into the ground, killing many. Battle may be won or lost depending on the actions of the PCs. After the battle PCs discover the location of the leader lich’s phylactery. PCs must go back to the surface to destroy leader lich once and for all. After being in the sky for 50 years, resources for the sky cities are limited and a large economic gap forms between the wealthy and the poor. Some of the poor turn to piracy for money and others enlist to fight the pirates and protect the goods of the rich. Now that you’ve got your outlines, that may be all you need to run your first session. If you want to share the world information with your players, post it on Obsidian Portal, or submit it for a job, you’re going to need to flesh it out a little more. With an outline in chronological order, it’s easy to throw down a few paragraphs to describe your world. There is one main hang-up I have that stops my writing cold – coming up with proper names. I like to keep my flow while I’m writing so I use simple placeholders. Then I go back and replace those placeholders after I’m done the lion’s share of writing. This seems to make everything go a lot faster since I can be focusing on fleshing out the outline and then switch over to proper name mode. I simply write NAME in all capital letters when I need a proper name I haven’t thought of yet. This makes it easy to find later when revising. Write no more than 5 – 10 paragraphs. Time is of the essence, pitches should be short, and if you’re writing this for your PCs or Obsidian Portal, know that most folks won’t read pages and pages of description. Here’s the description of the world I created for the pitch. If you have the time, go ahead and flesh out your campaign outline too. I wanted to do this for the pitch to give an idea of the adventures I’d create, but even if you’re not pitching it will be helpful to have a fleshed out description of your potential story to refer to. This is less necessary for home campaigns since you won’t be sharing it, but still helpful to you as the GM. Over-the-top action and sprawling mysteries will be the hallmarks of Bound Sky. The campaign opens with a massive airship battle. The players, hired as merchant guards, encounter pirates and battle for their lives. After the battle the heroes discover a mysterious message to the pirates from a higher power. These aren’t your normal pirates. They’re part of something much bigger. The story unfolds in Deldoroth’s soaring cities as our heroes uncover a conspiracy. The first learn that some of the pirates and then that some of the officials in Deldoroth have been working with the undead armies of Empress Vae. She’s planning something big, but to learn what will require closer investigation. The heroes journey down to the undead-infested Enora and navigate the dangerous territory by disguise or by stealth. Diving into old ruins, gathering intelligence from enemy-infested cities, and aided by the nomadic survivors of Drakefire, the PCs discover Empress Vae has begun building airships of her own and converting dragons to dracoliches. She is planning an enormous attack on Deldoroth. 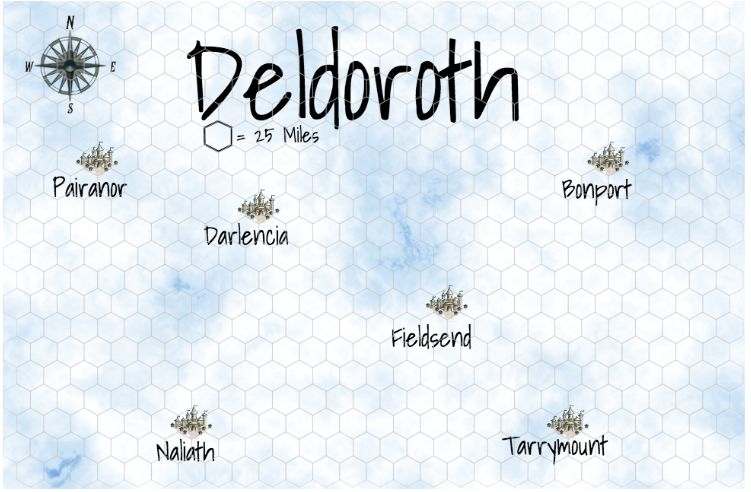 It is up to our heroes to convince the people of Deldoroth to work together to defeat this incursion. As they work to negotiate with various leaders, the PCs uncover another mystery. Empress Vae has discovered the source of the magic which keeps the cities of Deldoroth afloat. She plans to disrupt this magic and crash the cities. If she succeeds, the death toll will be catastrophic. The heroes stop Vae’s forces from destroying Deldoroth, but the victory is costly and the empress could return at any time with more forces. Thanks to a captured dracolich lieutenant, the PCs learn the location of Vae’s phylactery. 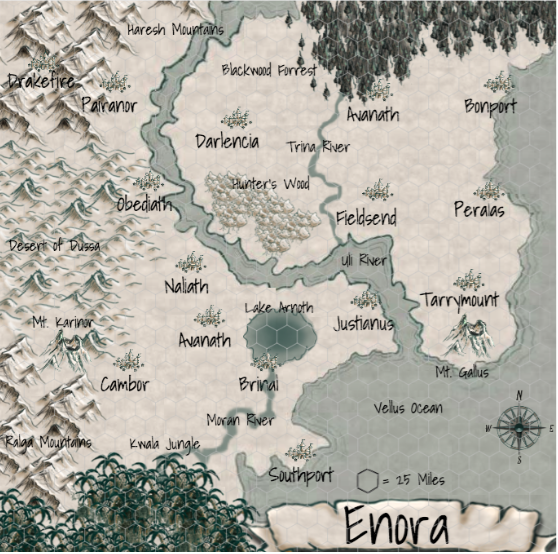 The heroes must make another perilous journey into Enora, this time into Vae’s stronghold in Cambor. It is up to them to destroy the phylactery and slay Empress Vae once and for all to save their homes. Check it out! I’ve even got a description of my first encounter in there. There’s enough information I could improv my way through the first session or possibly the entire campaign if I have no more free time to dedicate to preparation. 5. Got a Little More Time? Map it Up! If you have some more time, maps are great worldbuilding resources that help make your setting come to life for both you and your players. They’re also a good tool for judging travel obstacles and distances from one place to the next. I created the two maps below in less than hour using roll20.net, but you can checkout any number of easy to use resources to create a map quickly. So there you have it! One-hour worldbuilding. Simple stuff!